“An incredible debut. 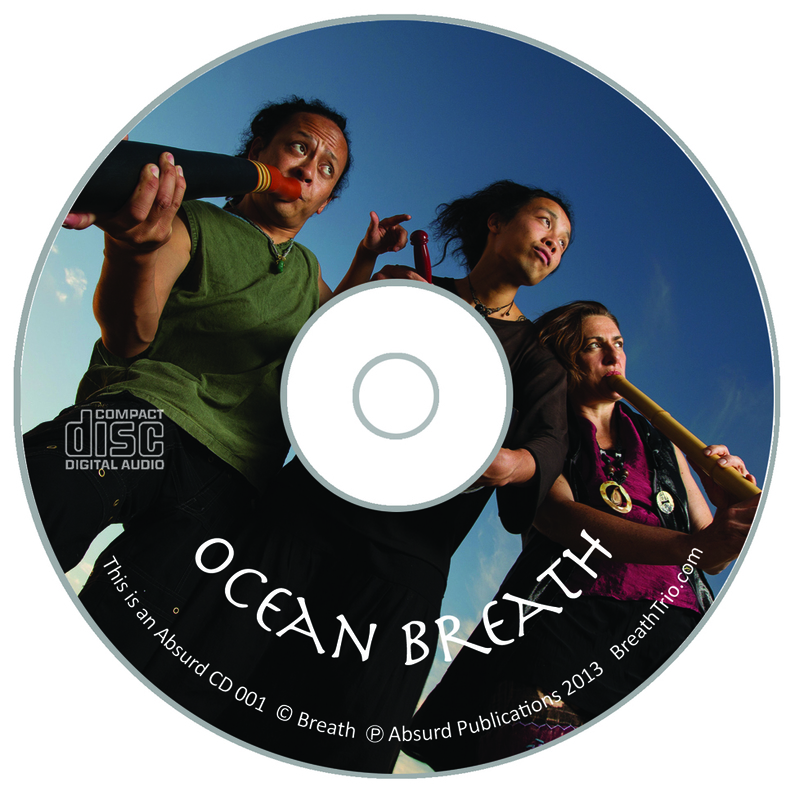 Breath is a beautiful concept….three talented souls creating gorgeous music using flute, didgeridoo and beatbox. This album is so atmospheric and calming. Some of the tracks are upbeat and pacey thanks to Reo’s awesome beatboxing and Sanshi’s virtuoso didgeridoo playing, while the rest of the tracks make perfect soundscapes for meditating and relaxing. My fav song is The Sea that Connects. It develops slowly and then goes into the coolest didgeridoo rhythm, all layered with lush flute and beatboxing. The beatboxing is stunning, Reo is able to get so many different, crazy sounds including fat bass lines, heavy beats and ethereal bird calls…incredible. “I really love it! …Great for playing during tea classes” – Angelina Yannuccelli of Tea&Sympathy. “the new album is amazing! My son dances along to the more up tempo songs and he’s just 18 months lol. He always liked that style of music and the didgeridoo sound.” – Josh P.
“This album may not be for everyone but it is a great addition if you enjoy music from around the world or just some relaxing ambient music to chill out to. Breath’s sound comes from a wide variety of instruments but mainly the Didgeridoo and the Shakuhachi will stand out most. The didgeridoo is played with great skill by an artist named Sanshi… a really cool guy and one of the best and diverse players of his instrument. The Shakuhachi could easily be confused for the sound of a Native American flute but with a louder sound to it. This is played by a very talented musician named Anne who … is equally gifted at her ability to play this instrument. The two sounds along with beat boxing by Reo all come together to form a very unique and beautiful sound that ranges from slow mellow songs to more upbeat and songs you can move to. This is where Anne shines with the Shakuhachi and holds her own against the quick tempos Sanshi can put out on the didgeridoo. All together it is an album I would recommend highly and even for those who are scared off by the sound of it being called “world music” give it a listen and you may just get hooked”. – review by InsomniaPuppet on Amazon. “Hey, the CD is fantastic. My Ghanaian friends who have heard it all love it too. Martin Jones is thinking about using a track for his routine in the Mr Ghana competition. I never realized all the harmonics in the didgeridoo music – wow! Very impressed all round cousin – kudos to the three of you!” – Tim Millikan, Ghana. We are seeking reviews of our new album. If you have any comments on a particular track or the overall journey of the album, we’d love to hear from you. One thing that is always difficult is how to describe the kind of music we play… what kind of music is it? I hate the label “World Music”… of course its world music… we made it on this planet didn’t we? And we are folk of the world, so does that make it “folk”? Labels… categories… boxes… beatboxes! Any thoughts?